Speculative Fiction is about viewing the world in different ways and imagining new interactions between people. Perhaps this is why so many authors have been attracted to SF as a place for reexamining gendered ideas and gender interactions. In this episode of Speculating Canada on Trent Radio, I note a few powerful Canadian feminist SF authors such as Nalo Hopkinson and Hiromi Goto. In particular, I examine the Canadian contributions to the collection Sisters of the Revolution: A Feminist Speculative Fiction Anthology edited by Jeff and Anne Vandermeer. This episode explores ideas of reproduction, heterosexism, imbalances in gendered power. This issue explores the power of speculative fiction to disrupt patriarchal assumptions about women’s bodies. I apply some of Joanna Russ’ ideas from “What Can a Heroine Do? or Why Women Can’t Write” (that explores the possibilities of a feminist Speculative Fiction and examines the feminist potential in speculative fiction) to the analysis of speculative fiction overall, but particularly to the work of Nalo Hopkinson and Hiromi Goto. Speculating Canada will be on Air at Trent Radio today for their Geek Day events. You can listen to a discussion between Derek Newman-Stille and Alissa Paxton today at 92.7 FM in the broadcast range or listen online to a broadcast stream at http://www.trentu.ca/org/trentradio/. We will be online at 10:30 AM and will be talking about the role of science fiction as an exploration of scientific ideas, pedagogy and SF, environmentalism and SF, exploring moral grey areas in Canadian SF, giving SF authors voice, and Canadian SF in general. 2200-Anon Dungeons & Dragons On Air – James Kerr, Bennett Bedoukian, Jess Grover, Jesse Louro, Garett Hotte, and Sable Guttman. It should be an exciting and fun day. discuss ideas about genre-crossing in SF, the ability of SF to challenge the status quo and propose new questions and ideas about how we can view our world, and the power of SF as a medium without boundaries. Interviewing Douglas Smith was an incredible experience because he has done so much introspection about his role as an author and is highly aware of his creative process. I hope that you enjoy hearing about his insights as much as I did. I want to thank Mr. Smith for being willing to do an interview for Speculating Canada, and I will let him introduce himself and his work below. Spec Can: Could you tell us a little bit about yourself to start of this interview? Douglas Smith: I’ve been writing for about fifteen years and have over a hundred and fifty short story publications in thirty countries and two dozen languages. 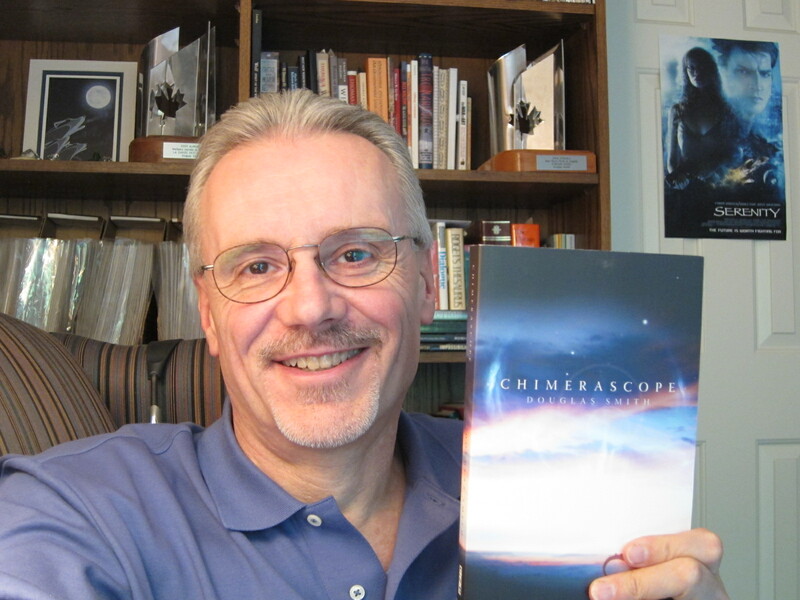 I have three published story collections: Chimerascope (ChiZine Publications, 2010), Impossibilia (PS Publishing, 2008), and a recently translated fantasy collection, La Danse des Esprits (France, 2011). My first novel, a shape-shifter fantasy set in Northern Ontario, The Wolf at the End of the World, will be released in 2013. I’ve twice won the Aurora Award, and have been a finalist for the John W. Campbell Award, the CBC’s Bookies Award, the juried Sunburst Award, and France’s juried Prix Masterton and Prix Bob Morane. A multi-award winning film based on my story “By Her Hand, She Draws You Down” will be released on DVD this year, and other films based on my stories are in the works. I’m Toronto born and raised, and live in Markham with my wife. We have two grown sons and a beautiful granddaughter. By day, I’m an IT executive, and by night I fight crime in the streets of the city–no, wait–that’s Batman. By night, I try to find time to write. My website is smithwriter.com and I tweet at twitter.com/smithwritr. Spec Can: Your work is extremely diverse. What is the key to being able to write in multiple genres of the speculative? Spec Can: What draws you to write Science Fiction? What can science fiction do that realist fiction can’t? Douglas Smith: I think that the genre’s greatest power as a literature is, to paraphrase the great SF anthologist Damon Knight, to hold up a distorted mirror to our current reality, to focus on some aspect of our world which needs to change (in the writer’s opinion). It’s that “if this goes on…” type of story that allows SF to provide a social commentary in a way that mimetic fiction cannot. That’s the power of SF and fantasy (and I’d put SF as a specific subset of fantasy)–there are fewer (no?) limitations to the types of stories that I can tell. The stories still need an internal logic and consistency, but I’m not bound by any concerns of matching current reality. That is wonderfully freeing for a writer. Spec Can: What draws you to write horror? Douglas Smith: I actually don’t consider myself a horror writer. I have only consciously sat down to write one pure horror story ever, and that was “By Her Hand, She Draws You Down.” That being said, my work often gets tagged as horror in “Best of …” anthologies and reviews, and many of my SF and fantasy stories do have horror elements to them. I’ve always thought of horror as more of a mood rather than a genre, so when I include horror in my stories, it’s more that I think those elements fit with the broader character arcs or the plot, rather than that I’m aiming at a writing a horror story. I don’t read horror, beyond some of the classics and the occasional Steven King or Clive Barker. I do tend to see a fair number of horror movies, but even those tend to the supernatural, rather than the slasher, real world horror stories. Serial killer or chain-saw massacre stories bore me. But I love werewolf or ghost movies, for example. I’ve written several shape-shifter stories, plus one vampire story that I didn’t realize was a vampire story until multiple reviewers began mentioning it as an unusual take on vampirism. And I’m currently working on a zombie story that really isn’t a zombie story. Spec Can: What can speculative fiction tell us about ourselves as readers and as a society? Douglas Smith: I’d go back to the “distorted mirror” analogy I mentioned above. Fantasy or SF can use other worlds–future or alternate–to focus on aspects of our real world, our shared beliefs, our conflicting beliefs, our humanity, our inhumanity, our potential, our failings, to let us view ourselves through a different lens, at a slightly different angle. Speculative fiction, by the very nature of its unreality, can make us see our reality in ways that mimetic fiction cannot. How we relate to those views, which messages resonate with us as individual readers, can then tell us something about ourselves. Spec Can: Where do your ideas come from? Douglas Smith: www.ideas’r_us.com. Just kidding. Ah, that question. The one that every writer gets at some point. It’s a very logical question for a reader to ask, but a difficult and often puzzling one for writers to answer, because, I think, readers and writers come at that question from very different perspectives. A reader sees a writer, and thinks “that person’s a writer. Therefore, they need ideas to write about. I wonder where they get those ideas.” This makes perfect sense, except that the experience for writers is exactly the reverse of that sequence. Asking a writer where they get their ideas is like asking a beleaguered doctor in an under-staffed emergency room where she gets her patients. And you’ll get a similar response from both: I don’t know and I don’t care. I just try to fix them up as best I can and send them out into the world. But I do wish that whoever is sending them to me would slow down a bit. Most writers are writers precisely because we are constantly getting ideas. And a lot of us would be quite happy to have fewer of them cluttering up our mental waiting rooms, thank you very much, because the only way to get those ideas out of our heads is to write them down into stories. Until we do that, they exist as nattering voices reminding us that they are waiting to be born onto the page. Let me give one example: my story “The Red Bird” (which appeared in On Spec #45) is an epic fantasy that combines martial arts, a lonely beach, and a very singular bird into a fable set in what might or might not be late 14th century Japan. So where did I get the idea for the story? I’m not sure, but I can explain the events that led up to the idea arriving. As a child, I spent many summers with my family at a rented cottage on Georgian Bay, just north of Wasaga Beach. My favourite memories are of early mornings, windy and overcast, walking on the wide sandy beach, alone except for the crashing of waves and the cries of the gulls. Many years later, I began studying karate with my oldest son, Mike. One summer, our club held a weekend camp at Georgian Bay. Much to my surprise, the location they chose was the same collection of cottages from my childhood summers, and I spent the weekend practising and sparring on that same beach. At the end of the weekend, I walked that beach again, remembering those mornings of long ago. Somewhere in that stroll, the story was born, initially no more than a strong image of a strange bird with burning plumage and god-like powers of life and death. I don’t know from where that image came, but just being in that physical environment with all of its past and recent memories stimulated the creative process for me, and influenced many of the elements that appear in the story. How a writer takes a kernel of a story idea and develops it into a story, however, is something that most writers can answer, and I think that’s your next question. Spec Can: Great prediction! What sorts of things are the points of genesis for a story? Douglas Smith: Sometimes it’s an unusual image, such as that strange red bird. Or a giant arch built from encased corpses (“Enlightenment”) or a house as big as the world (“Going Harvey in the Big House”). Sometimes it’s an opening line or a title, such as “By her hand, she draws you down” or “The universe ended at noon. Again.” Other times it will be an idea or situation, such as a drug that turns all emotions, even pain and sorrow, into joy (“Scream Angel”). I have also written several stories (and plan to write more) that were inspired by a line or situation in a Bruce Springsteen song (“Going Down to Lucky Town” and “Radio Nowhere”). Finally, it can be a character who shows up, and you know you need to figure out their story, how they came to be where they are, and where they will go from there. Or how they ended up where you’ve found them, because many of my story ideas start with the last image, the last scene. I rarely write a story in order, and often write the last scene before any other. And not all ideas that show up are good ones, so a writer has to perform some sort of triage on the ideas sitting in their mental waiting room, to reuse my earlier analogy. I have to decide which ones need to be pulled into O/R now and written before they drive me crazy (crazier? ); which ones need more time to diagnose and should be kept waiting; and which ones are the malingerers–ideas so incredibly stupid that I’ll try to ignore them and hope that they go away and stop bothering me until I see someone else resurrect them in a movie. Once I’ve decided to develop an idea into a story, for me, I need to know my characters. I can’t tell any story unless I can tell it as a character’s journey. If I don’t understand my characters, who they are, what drives them, what they want, then I can’t tell the story. For me, everything in a story is character. Plot turns must be based on character decisions. Even setting is character, since what the reader learns about the story’s setting must be through the senses of the story’s point-of-view characters, so what that character notices and cares about in the setting is what the reader experiences as well. I’ll give one detailed example of the genesis of a story, which also illustrates something else that I’ve discovered–that a single idea is often not enough. A story is stronger if it combines multiple, often seemingly disparate ideas. That is taken from the actual plaque in the Metropolitan Museum of Art in New York City for the actual painting, “Bouquet of Flowers in a Vase” by van Gogh. Art is a passion of mine (as a viewer, not a creator). When I travel, I try to visit the local art museums in that city, with a special interest in European art from the mid-1800’s through the surrealists. But my favorite artist has long been Vincent. I’ve seen (I think) every publicly viewable painting of his in every museum in every city I’ve ever visited. I’ve read his letters with his brother, Theo, and ever so many biographies. I’d always wanted to write a story about Vincent. I’d tried to write that story many years ago, a story about a woman in our time in love with Vincent and who (somehow) actually managed to meet him. The “somehows” that I tried didn’t work for me, so that story stayed in my head as one of those annoying little voices tickling me every now and then to remind me that it was still waiting to be born, until I found myself in front of “Bouquet of Flowers in a Vase” in the MMoA. I’d never seen the painting before, which was cool enough, but when I read the plaque, I knew that I had to use this somehow in my Vincent story. Van Gogh is one of the most researched artists of all time, and because of his extensive letter correspondence with his beloved brother, Theo, we have a running commentary of his entire artistic career, including what paintings he was working on at any time. For a painting to be unmentioned and undated was a wonderful mystery. But I still didn’t have my time travel “somehow”. Then one evening, a writer friend was discussing remote viewing and how it had been used in the field of one of her own passions, archeology, to search for the lost tomb of Alexander the Great. Somewhere in that conversation, the penny dropped, and I knew I had my time travel “somehow” to link my heroine in modern time to Vincent in the past. I did some research on remote viewing, from which came another part of my story: my main character, a former CIA operative. I added some tragedy in his past and a search for lost paintings, and the story (finally) started to take shape. So sometimes a story idea has a very long stay in the waiting room. 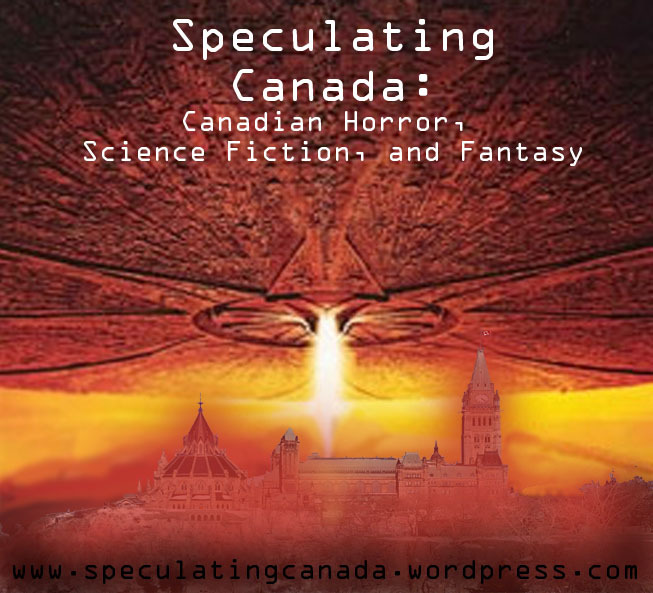 Spec Can: Where do you think Canadian Speculative Fiction is going from here? Douglas Smith: I have no idea, beyond bigger and better and more well known. We have an astoundingly talented array of speculative fiction writers, both established and emerging, all across the country, in all genres. At one time, I could give a list of recommended Canadian speculative fiction writers, but now I won’t even try because I know I’ll leave someone out and feel bad about it. As a timely example of both Canadian writing and the themes that it can deal with, I’ll point to the brand new anthology, Blood and Water (Bundoran Press, 2012), edited by Hayden Trenholm and featuring stories from Canadian writers about “the new resource wars that will mark the next fifty years – stories of conflict and cooperation, of hope and despair – all told from a uniquely Canadian perspective.” Full disclosure: my shape-shifter, logging activism story “Spirit Dance,” which is the prequel to my novel The Wolf at the End of the World, is included. Spec Can: What is distinctly Canadian about your work? What Canadian themes do you work with? Douglas Smith: Another tough question. While I’m thinking up an answer, why don’t you check out Karen Bennett’s wonderful “Fantastic Toronto” web site (http://www.karenbennett.ca/FantasticToronto.html), which is an extensively researched bibliography of science fiction/speculative fiction, fantasy and horror that is set in (or has major mentions of) Toronto. You’re back? Damn, I still need an answer. Well, beyond the Canadian and Toronto settings in many of my stories, now that I think of it, one of themes that recurs in my work, especially the Heroka shapeshifter stories, is that of the conflict between our civilization and the natural wilderness, as our resource-based industries, which feed our cities’ growing hunger for timber, water, power, minerals, and land, consumes more and more of the natural world and habitats of our wildlife. Our country has always been defined by its vast wilderness areas, and yet the huge majority of our population lives in only a few highly urbanized pockets of that vastness. So there’s this destructive dichotomy between us and the land we live in–we live off of the land but we don’t really live in it. But for those who do live there and for the wildlife species that live there, we’re destroying more of that wilderness every year to feed the hunger of the cities. This is the central theme in The Wolf at the End of the World and in most of my other Heroka stories. The Heroka are a race of shape shifters whose vitality as a race is tied directly to the vitality of their totem animal species, species that are dwindling as their natural habitats are destroyed by logging or mining concerns, or flooded for hydro-electric projects. Other Canadian themes in my work include a suspicion of both corporate and political power, a suspicion that I think is greater here in Canada than, for example, in the US. 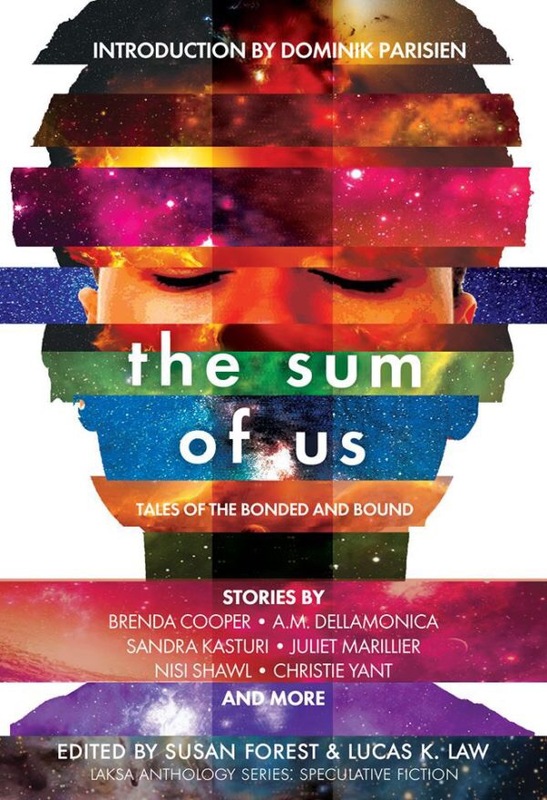 Spec Can: What are the values of writing short fiction? Douglas Smith: I think that short fiction remains the best way to “break in” as a speculative fiction writer and to build a reputation with sales and awards. It’s also the best way to learn the craft of writing prose. Short stories allow a writer to write across genres, to learn different techniques, to try different approaches from one story to another that the novel form doesn’t permit (or rather, it would take longer to do over multiple novels). And finally, quite frankly, if you’re a beginning writer, I think it’s wiser to invest your time in writing a few short stories and trying to sell them than in writing and marketing a novel. It’s a smaller hill to climb to find out if you can sell what you write. And to find out if you actually enjoy writing. For me, at this point in my career, I’m spending most of my writing time on novels. But I love short stories, both to read and to write, and will (I hope) always continue to write them. Spec Can: What inspired you to write the short story By Her Hand, She Draws You Down? What ideas did you deal with in this story? The genesis of the story came while engaging in that favourite past-time of writers, staring out a window, this particular window being on the GO bus (Toronto commuter thingy) that I was riding home that evening. I’ve found that a flow of images in that sort of situation seems to trigger some sort of subconscious creative process. Anyway, the opening line to the poem that opens the story and forms the title to the story arrived from somewhere, and then Cath, the tortured artist of the story, showed up to audition for the lead role shortly thereafter. This was the first pure horror story I ever wrote. It was an Aurora finalist and was selected for The Mammoth Book of Best New Horror #13. A movie adaptation of the story from TinyCore Pictures toured film festivals in 2010-2011 and is included on the horror anthology DVD, Gallery of Fear. Spec Can: What social issues can Science Fiction and Horror explore? If there is a social issue that a writer wishes to explore and bring attention to, speculative fiction provides the freedom through its “distorted mirror” to let a writer bring whatever focus they desire to that issue. I really see no limits. Rather, I think that SF&F offer more options for doing so than within the restrictions of mainstream mimetic fiction. Spec Can: What role does diversity play in your work? Douglas Smith: I certainly aim at a good balance of gender diversity. About half of my stories have females as the main character or a key point-of-view character. My upcoming novel, The Wolf at the End of the World, has three female and three male POV characters. Beyond a gender diversity, half of the main characters in that book are Anishinabe, both Cree and Ojibwa. Plus there’s a blind POV character (which was interesting to write). One of the characters is even dead, which is a sector of our society that is usually not given a voice, so I’m trying to do my part. My next novel, an urban fantasy set in Toronto, has a gay character. But I’m sure I could do more and plan on having even more diversity in my cast of characters in future stories. Douglas Smith: I’m not sure how virtuous it is, but it’s certainly fun from a creative perspective. Aside from that, characters outside the norm, whether they be aliens in our universe, humans from our possible futures, or characters from an entirely different reality, alternate or fantasy, aid in bringing the distorted mirror into focus. These characters can look at our world, our societies, our problems with fresh eyes and fresh outlooks, and thereby show readers a different perspective. Or they can just be freaking cool, giving a reader that sense of wonder that only speculative fiction can deliver. Spec Can: Your stories deal with some mythical characteristics. What can myths teach people in the modern world? How are myths still active in our world? Douglas Smith: The ancient myths were the way that humans tried to explain the unexplainable, and writers and artists are still trying to explain the universe and our place in it. Our myths simply change as we learn more. Science replaces a myth, but each answer we find simply leads to another area where we know nothing. Myths rush in to fill the void. We are story tellers and will always be story tellers. It’s part of being human–it’s hard-wired in us. We will always use stories to try to explain or to process our world and what it means to be human. So we will always be building myths–stories that try to explain, stories that everyone knows are myths but enjoy by pretending they’re real. The best stories, like the best myths, contain an element of truth that helps to make it all make sense. “In the beginning,” Wisakejack began, “Kitche Manitou, the Great Spirit of the People, dreamed of this world. Kitche Manitou knew that dreams are important, even for him, so he meditated on his dream and realized that he had to bring what he had dreamed into being. Zach suddenly felt solid ground under his feet. Rain wet his face, and a breeze moved his hair. He felt the heat of flames and smelled smoke. He still could see nothing but mist. Zach gasped. The grey mist was gone. A red sun sank over a broad bare plain of gray rock cut by a winding river, while a full moon peeked yellow-white over a tall, barren mountain under a canopy of stars in a black sky. From the bare expanse of rock, a forest of huge trees and undergrowth suddenly arose. Zach sensed something primal about this place. Something old–very, very old–and yet, at the same time, something still new, virgin. “He liked to do things in fours, didn’t he?” Zach said, looking around in wonder. Zach heard chirping and looked up to see a blue jay on a tree branch. When he looked back down, the coyote from his first dream sat beside him. Spec Can: You are able to really get into the minds of your characters. How do you get into the minds of alien or other than human characters? Douglas Smith: I don’t really differentiate between the human and non-human characters. Writing a story for me means understanding my characters and telling the story via their journeys through it. An alien may be completely different from us in physiology, intelligence, culture, spiritual beliefs, and moral code, but all sentient creatures will be motivated by something, both as a race and as individuals. It’s just a matter of understanding what is important to a character. And when I say understanding a character, I don’t mean completing one of those ridiculous “character sheets” that often get foisted on beginning writers. I couldn’t care less what my character’s favourite colour is or what they like for breakfast. If those details are needed in a story, fine, I’ll figure them out when I need to. But that isn’t understanding a character. Understanding a character means knowing what makes them tick. What gets them out of bed each morning? Or why do they dread getting out of bed? What are their passions? Or maybe they don’t have any. What do they truly fear more than anything? What do they want more than anything? What would they die for? What would they kill for? And most important for any story, what are they are missing in their lives right now that will drive all their decisions in their story? Spec Can: What is the role of the urban in your work? What can SF teach us about the city and cityscapes? Douglas Smith: I’d say that I have always enjoyed stories set in our modern cities where something of the other intrudes, unnoticed by most except (of course) by the story’s main character who is brought to a close encounter with the strangeness, either by chance or by intent. It’s one of the reasons that I enjoy the work of Charles de Lint so much. Other works that come to mind are the openings in the first books of Zelazny’s Amber series, Andre Norton’s Witchworld series, and Farmer’s World of Tiers series. Regarding what spec fic can teach us about urban life, it’s back to the distorted mirror again. We are becoming increasingly dependent on technology to make our complex urban civilizations run. But at what cost? SF contains multitudinous extrapolations of what our cities and city-dwellers might become. We’ve gone from the fanciful city of flying cars in early SF to darker and dystopic views, and I’d include my own “Going Harvey in the Big House” in the latter category. Spec Can: Is there anything else that you would like to mention to our readers? Douglas Smith: Just that I hope they’ll visit my web site at http://smithwriter.com and take a tour. If any of your readers would like to check out any of the stories I mention here, they are all available as individual ebooks at all major etailers or from the store on my web site, and are also included in one of my collections, Chimerascope or Impossibilia. And please look for my urban fantasy, The Wolf at the End of the World, in early 2013. Thanks for the invitation to be interviewed here and for the thought-provoking questions. I want to thank Douglas Smith for sharing his insights with us and provoking new thoughts and ideas about the future of SF and of human beings. To read more about Douglas Smith, check out his website at smithwriter.com. Click on Douglas Smith in the Tags on the left of this website to read some of my reviews. 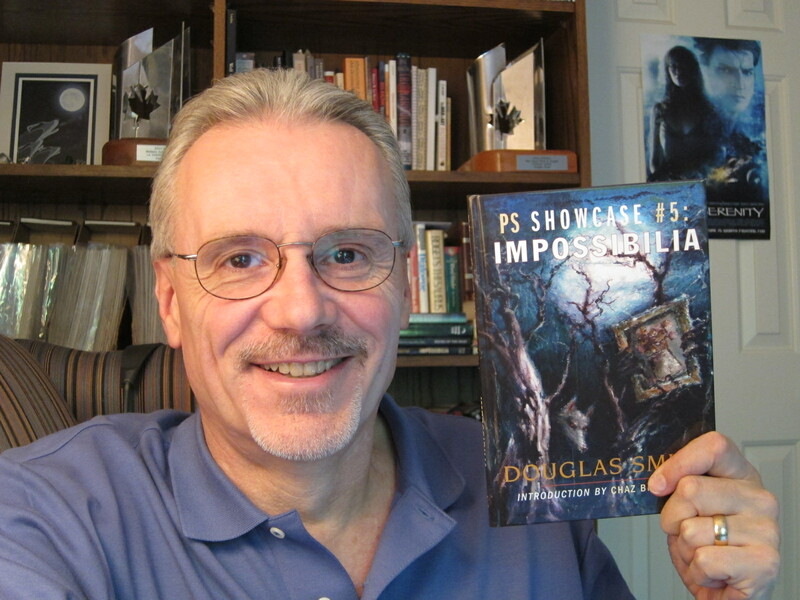 This week, I had the opportunity to interview Toronto author Douglas Smith. Smith’s work spans the speculative genres from horror to science fiction to fantasy, often blending and recombining speculative elements. You may have seen some of my review of Douglas Smith’s work on Speculating Canada, but if you have not, click on his name in the tags section to the left. Check out my interview with Douglas Smith this Saturday, October 6 and have an opportunity to gain some of his insights into his own work and the speculative genres in general. Explore Mr. Smith’s insights on how SF can be a medium for social change and can be used to question the paths that we as a human race are choosing, insights into the ability of authors to cross genres and the potential of SF as a means of freeing an author from limits, and a discourse on his inspirations and passions. I hope that you enjoy the upcoming interview and voyage through the distorted mirror that SF provides with Douglas Smith as your tour guide. Join us this Saturday October 6th for a great discussion. First, I want to open this editorial with a quick note that I think that the notions of “high culture” and “pop culture” are ridiculous and serve no real purpose. The idea that there is a genuine and openly apparent “high culture” that is obvious to anyone is ludicrous and demeans the individual appreciation and experience of art. When I say “art” I do not suggest that only certain forms of creative expression are “art” where others are “crafts” or “popular works”. I define “art” as individual creative expression and everyone has their own interpretation about what makes great art. Art, in my perspective is a creative work that evokes some sort of feeling from the observer – a shared communication through an artistic medium and that can be anything from a painting that has been preserved by a deceased artist who was obscure in their own time but is famous now to a milk dispenser shaped like a cow. Indeed, the fact that many of the artists that we consider “the greats” were obscure in their own time should be a lesson in the subjectivity of art, teaching us that art is variable and tastes change over time. There is no consistency in “greatness” – it is socially created and defined by structures of power (hegemonies), temporally contingent (i.e. at different points in history, different types of art and different works of art have been considered better than others and that shifts over time), and geographically manifest (i.e. from one place to the next, a different idea of what is great art may develop). What is “great” shifts from time to time, place to place, and group to group. What is important is that a work of art expresses something from the artist and makes the reader/viewer/experiencer FEEL something, think about something, experience something. “High Culture”, “Pop Culture”, “Art”, “Craft”; these are all labels without any meaning inherently held within them. They are socially created. Even though “high culture” is subjective, it still has cultural currency – it is still taken as a “real” thing and certain cultural expressions are looked down upon while others are exalted as truly meaningful. This line is often drawn between “popular culture” (pop culture) and “high culture” and speculative fiction (science fiction, horror, and fantasy) is often cast as a lower form of culture – something popular and not intrinsically artistically worthy. In Canada, realist fiction is generally exalted as the best form of high culture “Can Lit”, while SF often has the “literature” title entirely ripped away from it and is viewed as a lesser cultural form and generally treated as an “import” product, not really speaking to anything intrinsically Canadian. This de-Canadianising of SF does a disservice to the history of mythical realities inherent in Canadian life. After all, Canada is a meeting place of different people, a mixing and blending of diverse cultures. The country was formed out of an adventure in going to a new place (and horribly dominating and displacing the aboriginal inhabitants of this place and re-naming the land). And it is a place where there is a mixing of folklores, a mixing of mythic ideas – where myths of this place coming from indigenous Canadians can inform and mix with ideas coming from English, French, Irish, Scottish, Ukrainian, etc. European locations (since these European groups were the dominant colonizers of the period). Those mythologies have been added to by people from diverse parts of the world that have settled in Canada over the years. This blend makes it mythically interesting and allows for a blend of mythologies. We live in a mythic landscape, a landscape of blending, shifting, changing ideas. It is a place where we question identity, where we ask “Who are we?” and that makes it inherently speculative. 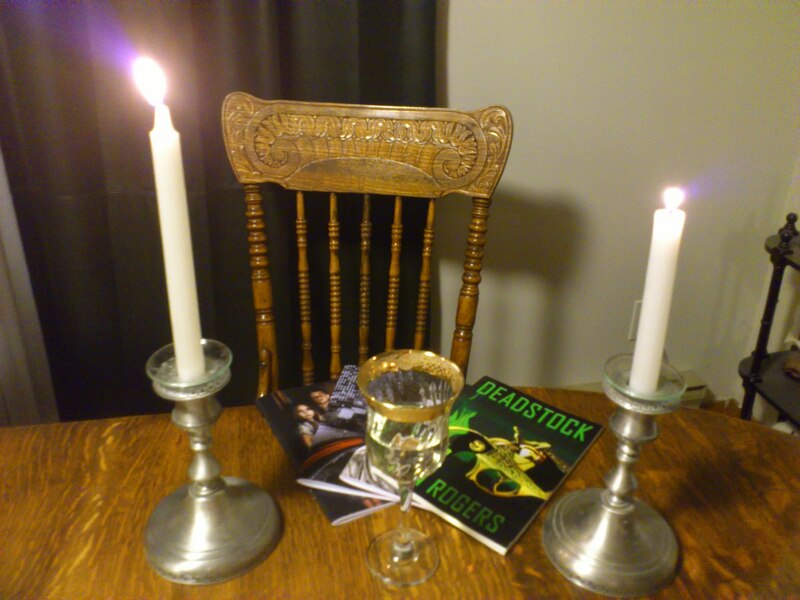 So, why isn’t Speculative Fiction THE Can Lit of choice? Part of this comes out of Canada’s post WWII search for identity and then the desire to establish Canada as an independent and different power in the 1960s. Canada wanted its own “Art” to distinguish itself, to express its independence while still remaining economically dependant on the US and UK. They wanted something that expressed life in Canada, so the forms of art preferred were those that portrayed Canadian realism and the ideas of Canada of the time: a place of vast natural wonders, a place of rustic life and the struggle against a forbidding environment, surviving in spite of oppressive forces. And, SF was considered too different from that reality, and due partially to the anti-American sentiment of American ex-pats who came to Canada in protest of the Vietnam War, and due to the popularity of SF in the American market, SF was viewed as something distinctly American and therefore not representative of the Canadian experience (which was trying to differ from the American economic and cultural powerhouse beside us). This is an over-simplification of the issue and there is a lot more complexity, but I want to keep this short. SF was an alienated discourse and also considered too “pop culture”, and – dangerously at a time when Canada was trying to distinguish itself from the US – too AMERICAN pop culture. This cultural baggage has lingered and SF is consistently cast out of the (ambiguous and subjective) role of “high culture” into “pop culture”. I am hoping to play a bit here and look at SF as REPRESENTATIVE of high culture. I will use David Inglis’ Culture and Everyday Life (2005) and its definition of high culture to do this. Inglis gives a great definition of “high culture”, but again, there are more sources out there. I chose Inglis primarily because I was reading it and chuckling about how much his definition of “high culture” sounds like SF. Inglis notes that when “high culture” is defined, it is often differentiated from “pop culture” by its “artistic quality and intellectual stimulation” (54). But Speculative Fiction includes the word “speculative” it “speculates”, it asks questions, and it challenges things. It therefore invites the reader to ponder and think about things like where the future is going, what horrors exist in the world, what would it be like if things happened differently, what makes us human, what different morals would develop in a different place or with a different and alien culture. Inglis, discussing Matthew Arnold’s (1995) notion of “high culture” points out the author’s belief that “high culture” should be one that evokes “a stream of fresh and free thought upon our stock notions and habits.” (1995: 199). This is precisely what SF does – it does not represent stale, normal reality, but rather invites the reader to think about reality in a new way, to question it and look past the facade of reality to what makes our world the way it is, and why it is different from other visions of the world. SF shows us different ways of living, different worlds that are distant from our “stock notions and habits”. It opens the mind to new vistas of experience and expression and challenges us to question everything that exists in our world. “Pop culture” is also often differentiated from “high culture” based on its alleged simplicity (Inglis, 2005: 54). What is simplistic about creating a whole new world full of people that are fundamentally different from us (while simultaneously like us and relatable to our experience)? With realist fiction, there is a ready-made world, full of stock experiences that the author can call on from their lived experience or the lived experience of others. Does that make realist fiction more simplistic? More “pop”? Inglis also notes that “high culture” is often defines by its ability to challenge people to “re-think our views and attitudes about the world” (ibid) and what does this more than proposing a different world, a world with different rules, roles, and attitudes? He points to the almost religious experience of being “cleansed by a ‘stream of fresh and free thought’” that makes our abilities to reflect and think stronger and has a beneficial effect on our imagining (2005: 54-55). What poses a better imaginative force than a world with different rules than our own, a speculative reality that differs from the ‘normal’ world? Most of all, he suggests that great works of “high culture” is so evocative that “viewers or listeners are mentally pulled out of their everyday existence… [and] it involves a transcendence of mundane and everyday concerns toward reflections upon the great questions of human life” (2005: 55)… I don’t think I even need to comment on the merits of SF in this respect…. (I should point out that although Inglis talks about definitions of “High Culture” versus “Popular Culture”, he does complicate in his work and suggest, much like myself, that the category of “high culture” is nonsensical and subject to interpretation). Editorial – Is There Actually Something Canadian About Canadian SF? One of the things that is gradually being more and more ignored in analyses of Canadian SF is the regional aspect. So many people focus on the need to see Canadian literature as international, rather than also looking at its regional qualities. Yes, Canadian literature is international, but really all literature is international – creative processes are international ones, fed from the influences of all of the reading that the author has done. But, their regional experiences also influence their writing – it is a conversation between the international and the local. Authors like Nalo Hopkinson have discussed their experience of coming to Canada and learning about the Canadian experience by reading Canadian SF, getting a sense of this alien environment by reading about the aliens and social others that are produced through the Canadian imagination (Final Thoughts in Tesseracts Nine). I understand why so many authors want to focus on the “international” quality of their work. Ultimately, they want it to be read outside of their country of origin – they want to have a larger readership. But, this is often only the case for people from countries that have less established histories of SF. The American and UK markets are quite comfortable with calling their work distinctly American or English, setting the story in their own country and flavouring it with local dialect and setting. Canadians are less inclined to do this because they know that overwhelmingly the market is dominated by Anglo-American SF works and they are often told by publishers that their work won’t sell in the United States because Americans won’t read about places other than the United States. I think this is highly unrealistic and assumes an unadventurous quality in a group of people (SF fans) who are obviously quite adventurous – they are willing to imaginatively explore other worlds, new environments, and new and diverse cultures in their literature, certainly they would not be adverse to reading about a country next door. Yes, literature should be international, but what is often meant by this is not actually international, but, rather, marketable in the larger Anglo and American markets. Canadian identity is a complicated issue, so many people feel that rather than try to think about the Canadianness of their work, it is far easier to assume that Canada is a cultural blank slate that does not have a cultural imprint on the things that occur within it. This does a disservice to Canadian literature, and also ignores the experience of new Canadians (people who have immigrated to Canada), who are often told that Canada is an easy place to adapt to and therefore that they shouldn’t have any difficulty fitting in. When they inevitably do experience difficulties such as racism, exclusion, and even culture shock, they often internalise this experience and, rather than criticising Canada’s lack of inclusivity, will criticise themselves for not fitting in. It is important to be aware that we do have a regional culture – a culture that is not monolithic, that is changeable, that is often based on questioning itself and asking itself what it is. Canadian culture is Speculative. We don’t believe we have a culture, so we always ask ourselves what it is. The great part about this is that’s what Speculative Fiction is all about – asking ourselves about ourselves. It is in the mirrored gaze of the alien’s eye or the monster’s saliva that we see the image of ourselves. We create our aliens and our monsters from our own imaginations and they embody our fears, our desires, our thoughts about our place in the world – they tell us about ourselves. The best thing that we can say about Canadian culture is “it’s complicated” and it is always going to be about living the question, speculating. – and that is okay, in fact, it makes it interesting. As SF fans, we should be okay with living with ‘the question’. We do it every time we read our favorite books.